Got questions? Check out our RUG GUIDE. To clean spills, blot the area immediately with a clean cloth or sponge. To vacuum, please use without a beater bar or adjust to a low power, high pile setting. Vacuum the full length of the rug, turn and repeat on the next area rather than using a back and forth motion. Avoid all liquids. Professional cleaning is recommended. Please use with a rug pad on hard floors. A beautiful medley of texture, color and style - we dig this modern shag rug. 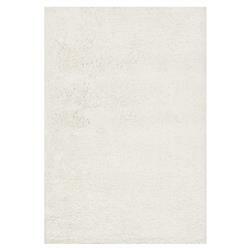 The cozy ivory rug is incredibly soft underfoot and a lovely, textural addition. Threads of varying thickness add to its dimensional quality. In a den where you love to lounge or by the bedside, you're going to love the look and feel of this rug.